Barbara Donahue has been extraordinarily generous to UMass Memorial Medical Center and its academic partner UMass Medical School over the years, helping to make possible the acquisition of such life-changing equipment as a dedicated breast CT machine, a specially equipped emergency response vehicle to bring physicians to the site of medical emergencies, and technology to help care for infants born with brain injuries. Her latest gift has enabled the purchase of three specialized monitors for the neonatal intensive care unit (NICU)—and it’s already having a big impact on the way UMass Memorial is able to care for its littlest patients. 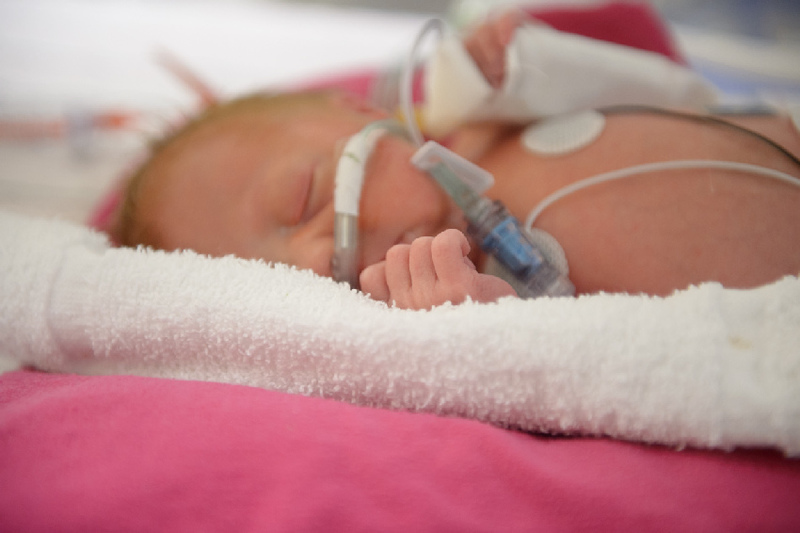 These state-of-the-art machines enable NICU doctors and nurses to non-invasively assess the levels of carbon dioxide (CO2) in the blood of these tiny infants. “In the old days, to measure a patient’s blood levels of oxygen or carbon dioxide—which is essential in assessing patients’ lung function—we had to draw blood,” he said. “A couple of decades ago, a non-invasive way to measure oxygen status was developed that uses a probe on the finger, or a sticker affixed to an infant, that displays what those levels are every second. Chief of Neonatalogy Larry Rhein talks with Mrs. Donahue about the importance of C02 monitors in the NICU. Dr. Rhein pointed out that this new technology improves the way the NICU is able to care for these patients in two important ways. “Before, to the naked eye, a baby might look stable but her CO2 could be going up suddenly,” he explained. “However, we wouldn’t know that until she was in obvious distress. These new monitors signal us to intervene before the infant is in distress, which translates into better care—and better outcomes. “We also want to wean babies off ventilators as quickly as possible, so they’re not exposed to unnecessary treatment,” Dr. Rhein continued. “Now we can do this with much greater confidence since we can better monitor their lung function. Mrs. Donahue discovered UMass Memorial’s need for these monitors while visiting the NICU to see how her previous donation had helped. While the NICU already had one of these ventilation monitors, its use had to be rationed, sharing it among the babies who needed it most. Dr. Rhein told Mrs. Donahue that if they had more of these pieces of equipment, they could make the technology more available. “So I asked how many they needed, and they said three,” she said. “So that’s how many I wanted them to have, so they’d have a little fleet of these machines.